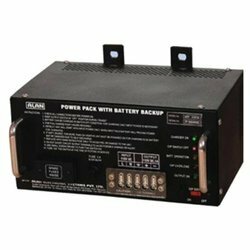 Wholesale Trader of a wide range of products which include power pack with battery back-up and current and potential transformers. 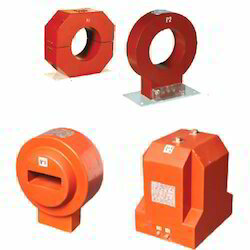 The power pack is used as a power source for VCB panels in substations where station battery supply is not available. Power Pack gets charged from line connected PT (burden 200VA). It can supply DC connected loads for operating Close/trip coils and other essential loads such as auxillar y supply to protection relays etc. 3. Output Voltage *: 24VDC / 30VDC / 110VDC / 220VDC. Impulse Load : 450 W for 240 mSec. Bat tery Charging Period : 8 Hours. 1. Over Voltage Protection: During No Load operation and battery charging ON, Output DC voltage shall not exceed more than specified voltage. 2. Short Circuit Protection: Short Circuit protection has been provided on the output side. When short circuit condition is removed output resumes automatically, without any manual reset. (a) Charger On, (b) Output Switch OFF, (c) Battery Operation, (d) Output Overloaded, (e) Output ON. 4. Output ON/OFF switch is provided on front side of the unit. Compact Design – Fully encapsulated one piece epoxy resin insulation.